OPEN YOUR HEART & STILL YOUR MIND CENTER, GROUND & STRENGTHEN YOUR BODY PURIFY YOUR ENTIRE SYSTEM & FREE YOUR HIGHEST SELF IGNITE YOUR LIGHT & BALANCE YOUR LIFE! NOW YOU TOO CAN LEARN THE 333 SOLUTION TO ANY CHALLENGE IN YOUR LIFE. THE SOLUTION EXISTS WITHIN THE PROBLEM. LEARN HOW TO USE 333 IN YOUR LIFE. IT ALWAYS WORKS FOR EVERYONE...EVERY TIME! 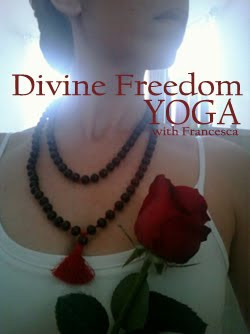 Join us for the Free 333 Workshop on February 25th - OPEN TO ALL. Please read this letter from Jasse Matasse, Life Success Coach & Hypnotherapist, who has been facilitating the powerful MasterMind Groups at the Church of Spiritual Light for the past several months. It was the best cup of coffee I’ve ever had! I have used the 333 technique over the years to come up with ideas for my own business as well as helping my coaching clients. It always works. Now you can use it too! After our regular MasterMind class on Thursday, February 25, I’ll be teaching you how to use 333 in your life and business. We’ll begin promptly at 1:45 PM – 2:45 PM. The intention of this 333 is to help our fellow MasterMinder, Reverend Renee Bledsoe, Visionary and Founder of The Church of Spiritual Light to generate additional revenue. All Renee has to do is decide what she wants and when she wants it. You’ll learn, by observing or participating, how easily the technique works. Is there someone in your life that you would like to help? Do you know someone who is struggling with life or business right now? This free one-hour training class is open to anyone you would like to invite! Here is what Bob Proctor told me in that hotel restaurant. It appears on pages 187-191 in his book “You Were Born Rich”. The following night, I was doing another seminar in Toronto. Bob Templeton and Bob Johnson, another vice-president from Telemedia, came in and stood at the back of the room. They were evaluating my seminar, trying to decide if I could help their company reach its goals, which I ultimately did. Because of Bob Templeton’s influence, I subsequently worked for the entire Canadian broadcasting industry. He loved what I was doing in my seminars because it was in harmony with his way of thinking. Bob Templeton’s became fascinated with the laws of the universe, particularly The Law of Polarity or as it is often referred to, The Law of Opposites. This law clearly states everything has and opposite. You cannot have an up without a down, hot without cold, or in without out. By the same token, if you can figure out why something you want to do cannot be done, by law, you must be able to figure out how it can be done. People who accomplish great things are aware of the negative, however, they give all of their mental energy to the positive. After the seminar, Bob Templeton went back to his office. He told me it was late but this one idea he picked up had him excited. It also had him committed to the idea of raising millions of dollars and giving it to the people who had been caught in the tornado, and he was going to raise the money immediately! Furthermore, he was not remotely interested in why he couldn’t. For 28 years, as a Speaker, Life Coach, Columnist, and Hypnotherapist, Jasse "jazz" Matasse's passion continues to be showing you how to bridge the gap from where you are...to where you want to be! Know someone who needs help but cannot make the workshop? Have them e-mail Jasse and request a free handout. 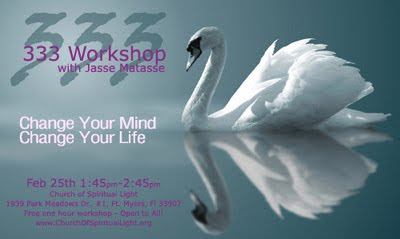 Put 333 in subject line at jasse.success@gmail.com or call 772-332-3889 today. I am the co-founder of an all faith church, called Church of Spiritual Light, located in Ft. Myers, Florida. When we were birthing this church we knew right away that even though it was not centered around religion that we were to call it a "church" and not a spiritual center. I'd like to share with you the reasons for this, at least the ones that are known to me at this time, because I think it is an important call sign of the times at hand. First of all the impetus for this church is love, the celebration of the love of the Light, the divinity of the limitless substance that we are, that all dense matter originates from as made manifest through the mediums of color and sound. After all we're not called Hue-man for nothing! This celebration includes many things, such as inspirational high teachings, sacred ceremony, ritual, meditation, blessings, music and most of all community, sharing, caring, nurturing and fun! It could be said that a spiritual center certainly does all these things, so why call it a church....and risk alienating people who have been damaged by organized religion as it's been conducted in the past? The answer is quite simple: We are here to facilitate a healing of that very damage by changing the way the mass consciousness sees the "church". For if the earth is the mother, then the church must be the bride. Equally as beautiful in her wildness, equally as awe-inspiring in her natural beauty, as she is breathtakingly radiant dressed in the purity of her white bridal gown and soon to be parting gossamer veils, becoming elevated in our consciousness and revealing her glorious face to the cosmos - kissed, adored, admired and respected. What if the ritual of church signifies the elevation of the divine feminine to royalty and draws her into the heights of the spiritual realms? What if in that sacred space made by human hands we create a sacred conscious container, which is the divine feminine principle and the divine masculine in union, complimenting one another and bringing forth wholeness in a living environment to all people in a community? What if this is the sanctification ceremony of the sacred marriage re-affirmed again and again when we gather there? It is in this space in consciousness, which can manifest and out-picture in the physical as a church, that we understand that our holy mother and father are within us. Do you have a holy place in your mind? Is your soul an altar before the world? Do you know where the holiest of the holies resides within you? These are important questions. To have a place devoted exclusively to this purpose is an affirmation of the consciousness in union. For until we establish conscious contact with both our divine mother and father we are orphaned or abandoned by one or the other by our own hand. And this is out-pictured every day somewhere in our relationships. Healing the relationship within is the only thing that can bring us closer to a state of wholeness, to the sacred marriage. One of the most important things that a church can have the power to do is bring us to our ability to open ourselves to the parts of our SELF that do not communicate in words. For many people this is a frightening and mysterious prospect because we are learning how to speak a new language and it can be difficult to communicate with the parts of ourselves that we have denied, nor have a logical frame of reference for. But it is critical to do so because having contact with those very parts is what it takes to bring transformational healing, enlightenment and a restoration of the Self to the Self. Ritual, sacred ceremony, music, meditation, blessings and contemplative prayer take us out of the world of words alone...and return us to the core of our self....and in the process purifying and clarifying what comes out of our mouths and returns the true power of the word. I submit to you that taking that holy day, SUN day, and making it the holy of the holies, unplugging your mind from the madness of the mass consciousness for one day, not absorbing nor giving out any energies but that of worship, appreciation and gratitude would change the entire world. Does it matter what day you do it? Why Sunday? Because someone told you to? The answer that I have been given is that this is the day that we all picked when we were in our unmanifest form to take a BIG TIME OUT in unison, in an all together now hold hands and jump into the void sort of way. 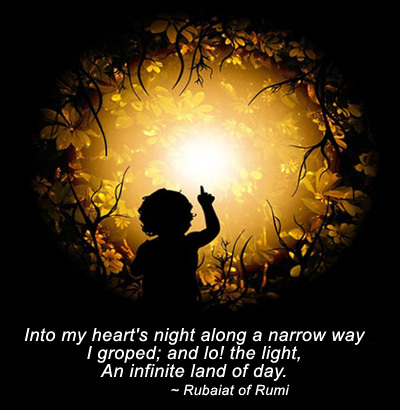 This is the moment when we come together in tandem, tame the ego and say ONE FOR ALL. So why not consider setting aside sUNDAY as a time to rest, surrender and celebrate...breathe in this amazing body of divinity that we are. It is something beautiful, romantic, poetic, nurturing and lovely to do for ourselves and for all that is. And it is the Goddess at work in one of her many forms with her silent, behind the scenes funding, fueling and sourcing of the soul, being ushered in and protected by her Groom as they stand side by side doling out love and light. I predict that in the not too distant future Church will never be the same. It is the end of an age. We are so blessed to be alive at this time and reaping the rewards of our ancestors. Yes, it is the end of an age, and that means it's the beginning of a new era. I wonder what we're dreaming. What an honor to be awakened to the Mother and Father God within and to be able to summon this powerful force to create a life and a world of absolute beauty, love, peace and prosperity. May you walk in beauty, always and in all ways. 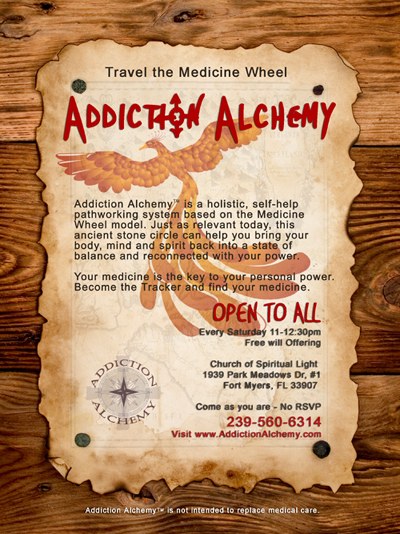 The Addiction Alchemy journey work is now open to the public in the format of a weekly gathering for the first time. Each week we will travel the wheel in this 1.5 hour gathering to work with the energies contained within this sacred stone circle. The Medicine Wheel can help you bring your body, mind and spirit back into a state of wholeness and balance, reconnecting you to parts of your SELF that you may have forgotten, re-establishing the knowledge of your interconnection to all that is. Using the process of life itself, people, animals, the earth and all our relationships we rediscover who and what we truly are. Become the tracker in your own life, learn how to read spiritual messages that are all around you, tap into the power of animal guides and archetypes, learn about sacred ceremony and much more. For more information visit www.addictionalchemy.com or call Rev. Renee Bledsoe at 239-560-6314. All are welcome, so spread the word! Click here to download and print out a flyer. true love is for the treasure, not for the coffer that contains it."